All of Iran lies within a major earthquake zone, and the country has suffered terrible temblors before  most recently in 2003, when a 6.8-magnitude quake leveled the ancient city of Bam and killed more than 30,000 people. But a similar quake in the congested capital of Tehran  where more than 7 million people live  would be a shattering catastrophe. 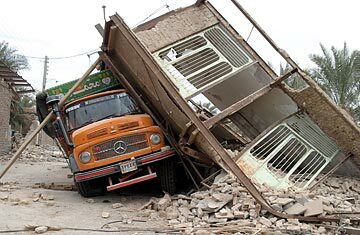 Unlike building codes in other endangered cities such as San Francisco and Tokyo, Tehran's are relatively lax, and many residents live in the sort of unreinforced-concrete houses that turn into death traps in the event of a strong quake. The Iranian Health Ministry once estimated that a 7-magnitude quake would destroy 90% of the city's hospitals. Tehran is so threatened that there has been periodic talk about moving the capital. See pictures of Pakistan reeling from an earthquake.